The soothing sweetness of the leng chee kang goes down well with many a foodie. LENG Chee Kang or sweet lotus seed soup is a traditional herbal dessert you would find in Chinese hawker stalls. The best part about a bowl of Leng Chee Kang is the various ingredients that lend textures to the dessert. Served hot or cold, it has ingredients which are traditionally used to cool the body such as the chewy white fungus, red dates, longan and barley seeds boiled to tender softness, kembang semangkuk jelly and rock sugar for sweetness. Popular dessert: Carol with a bowl of the cold Leng Chee Kang. In some stalls you would be lucky to find red dates, jelly and a hardboiled quail egg in the equation. Kembang semangkuk seeds are used to make the brownish jelly-like substance in the Leng Chee Kang. The dry seed pulp when soaked in water will absorb up the moisture and swell into a dirty-looking mucilage. Besides being used to make desserts, the jelly made from the kembang semangkuk is also known for its medicinal values. It is not difficult to find this dessert in the Klang Valley as even Malay restaurants and stalls at the pasar malam have started selling it. Of course, the concoction might vary a little from the traditional one. One stall in Petaling Jaya which is popular for this dessert is Gerai Minuman Aneka at the Uptown Square food court in Damansara Uptown. 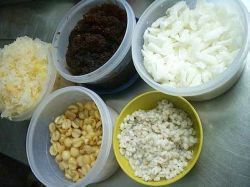 The ingredients: (clockwise from left) White fungus, kembang semangkuk jelly, rock sugar, barley and lotus seeds. This stall, which sells all kinds of famous Malaysian dessert drinks like Cendol, Soya Bean, Leng Chee Kang, Cincau, Bubur Cha Cha and ABC or Ais Batu Campur, has been around since the establishment started 11 years ago. It has served many locals from near and far. The stall operator, who only wants to be known as Carol, claims that their biggest client is the Prime Minister Datuk Seri Abdullah Ahmad Badawi himself. There is a photograph of the Prime Minister visiting their stall, pasted outside the stall. “The Prime Minister has not visited this stall actually. The photograph was taken at his residence when we set up a stall there during a Hari Raya open house. “He must have heard that our Tau Fu Fah and ABC are good as he would place orders with us whenever he holds a function. “Gerai Minuman Aneka has been given the honour to set up a stall at the Prime Minister’s residence whenever he holds a Hari Raya open house. “We are honoured to serve the Prime Minister and happy that he enjoys our desserts,” she says. 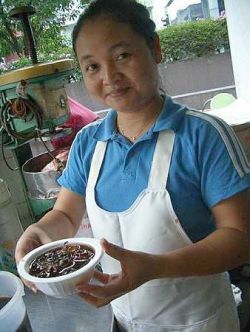 Carol claims that they are known for their Leng Chee Kang, Soya Cincau, Tau Fu Fah, ABC and Limau Asam Boi, among others. The stall operates from 6pm till late night and receives a few hundred orders daily. The Leng Chee Kang is sold at RM2.30 if you are dining in and RM2.80 for take-away.